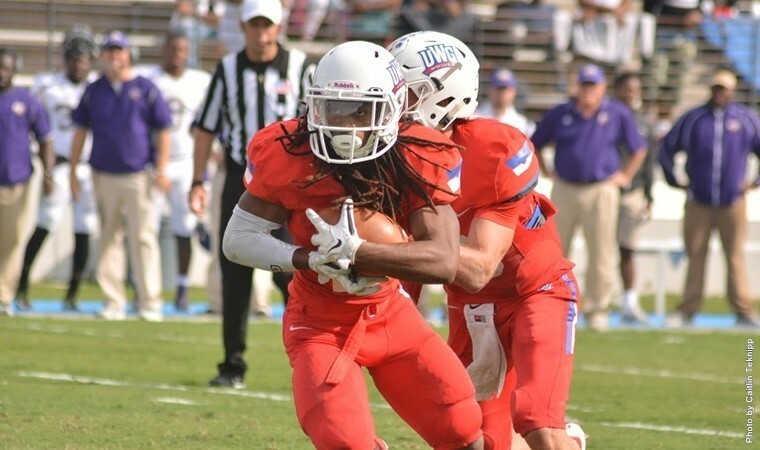 UWG Stays Perfect, Moves to First in Numerous DII Polls. The West Georgia defense was phenomenal Saturday in their 31-10 win over the 11th ranked North Alabama Lions. This win gives West Georgia an 8-0 record on the year. The win, paired with a #1 Minnesota State-Mankato loss, moved them into the #1 spot in the DII national polls. Before the game, North Alabama was averaging over 500 yards of offense per game, with 235 on the ground. They were the conference leaders in total offense per game, and West Georgia was the #1 in defense in the conference. 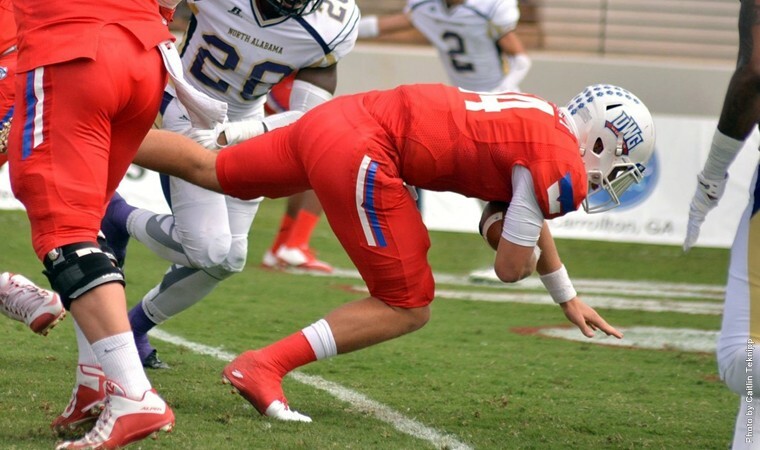 UWG held them to well below their season averages, giving up just 318 total yards, 139 on the ground. 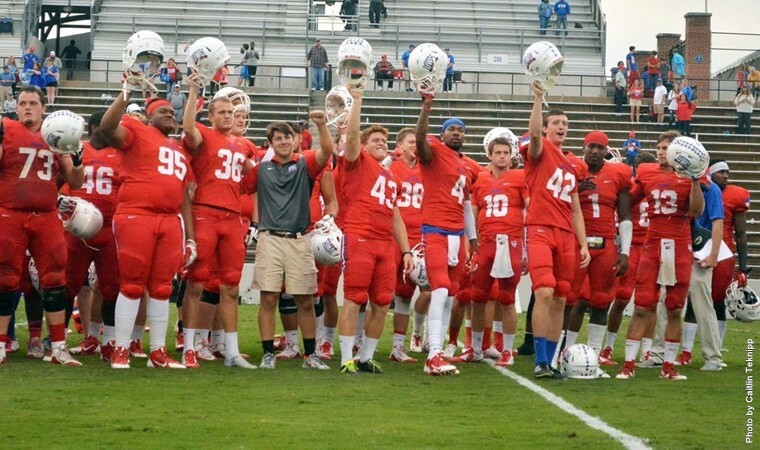 UWG broke out the red jerseys for the first time since 1996 in front of a crowd of 6,827 at University Stadium. They performed their weekly wolf walk an hour and a half before kickoff in their blue jerseys and red pants. The red jerseys were waiting on them in their lockers when they got back. This was a huge hit with the players, as they erupted with joy when they saw the jerseys. Whether it be calling every student at West Georgia on game week, breaking out uniforms that haven’t been worn in 19 years, or firing up students at the tailgate, Coach Hall continues to impress the people of UWG, the city of Carrollton, and even the DII football fans nation-wide. Saturday, before I walked up to the press box, I made sure to stop by and check out this week’s wolf walk. 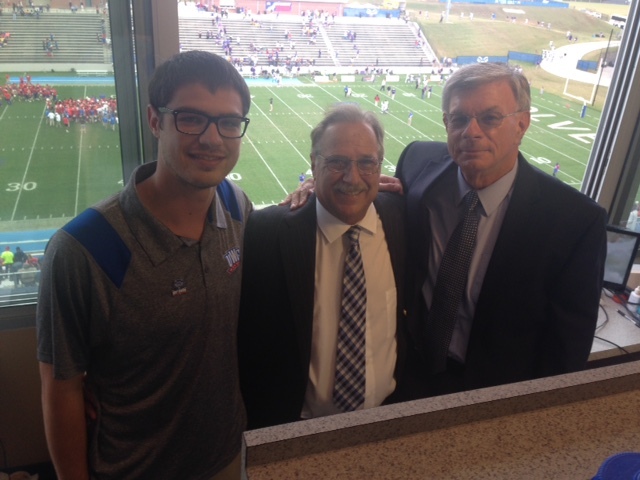 This continues to be a huge tradition for UWG fans and looks to be more impressive each and every week. Aside from maybe a couple of press conferences or possibly one of my articles floating around, I do not believe Coach Hall has ever seen my face. Saturday, during the wolf walk, he came up to me and shook my hand and thanked me for coming out and said it was great to have me there. My point with this is to show how much Coach Hall has changed the atmosphere at UWG. He knows that home field advantage is a huge part of the game and has done numerous things to improve game day attendance for West Georgia. He cares tremendously about his players, coaches, and the people of West Georgia and it shows on the field, in press conferences, and definitely during the Wolf Walk. Coach Hall and the Wolves have captured the attention of many people around the country with their perfect start to the season. Todd Grisham, anchor for ESPN, is an alumni of UWG and has mentioned them numerous times this year on-air and on social media. UWG received the opening kickoff and took the ball all the way down the field. A trick play by the Wolves ended the drive, when a Qa Walker reverse pass was intercepted at the 1-yard line. UNA then drove 90 yards, but was forced to kick a 26-yard field goal. After the successful attempt, UNA was up on the Wolves 3-0. West Georgia then took the ball and drove to the UNA 2-yard line. Three straight plays of 20 yards or more were used this drive before Will Garrett ran it in from two yards out. After the PAT, UWG was up 7-3 on the Lions. Junior Dylan Donahue got his 7th sack of the year on the next drive, which forced the Lions to a three-and-out. A 13-play, 75-yard drive then ensued and was ended with a 24-yard Hunter Heck field goal. This gave UWG a 10-3 lead with 11:07 left in the second quarter. UNA was forced to punt again on the next drive and UWG took advantage. 14 plays and 81 yards later, Devontae Jackson ran it in from 9 yards out. Heck’s PAT made the score 17-3 in favor of the Wolves. Not much time was left on the clock when North Alabama took over on their next drive. The offense was able to drive down to inside the West Georgia 15, but their attempt at a field goal was blocked by Marcus Sayles, his fifth block of the season. The blocked field goal was picked up and returned for a touchdown by the Wolves, but a block in the back penalty took away the score and ended the first half. UNA was stopped again by the Wolves on their opening drive of the second half. This gave Dallas Dickey and the offense the ball on their own 49-yard line. Not long after they took over, they were scoring again as Will Garrett ran it in; this time from seven yards out for his second of the day. UWG was up 24-3 after the PAT with 10:37 left in the third. As you may have guessed, West Georgia forced another UNA punt giving UWG the ball at their own 47. Devontae Jackson led them down the field and scored again; this time from eight yards out. This drive was 6 plays and 53 yards. 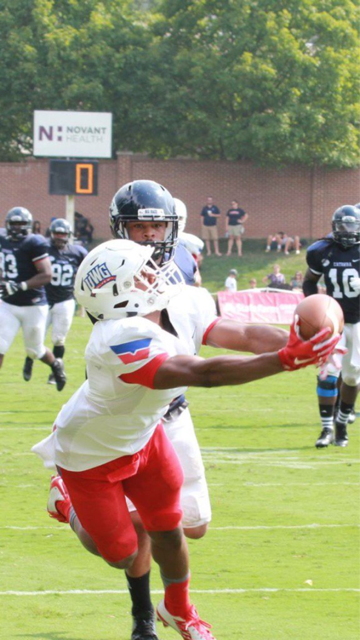 It gave UWG its biggest lead of the day, 31-3. Luke Wingo finally got the Lions on the board again early in the fourth on fourth down. Wingo was knocked out early in the game due to an enormous hit by Marion Chapman of West Georgia. The hit drew a personal foul and knocked Wingo out of the game only temporarily. This was only one of West Georgia’s 15 penalties for 127 yards. Not long after the hit, it was reported that Wingo had a dislocated shoulder and would not return. 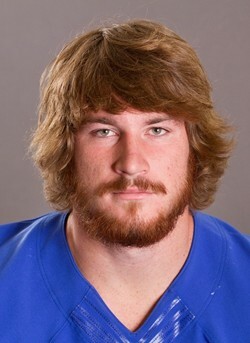 This would be the second week in a row that UWG faced a backup quarterback. To everyone’s surprise, Wingo did return in the first half. I am not sure if they popped it back into place and then he returned, or if the report was false. 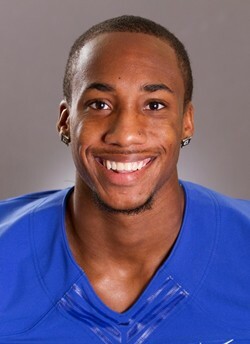 Either way, Wingo played very hard in the game against a tough UWG defense. Dallas Dickey then uncharacteristically threw an interception, a play in which a personal foul was called on Coach Hall. After the penalty, Hall faced the crowd and publicly accepted it. The crowd immediately changed from upset about the turnover, to cheering for Coach Hall. Just One play later, junior Jason Carr intercepted Wingo’s pass, and gave the ball back to the West Georgia offense. Shortly after that, a fumble by the Wolves gave the ball back to North Alabama on their own 38-yard line. Wingo led the Lions all the way down to the West Georgia 3-yard line, but a tremendous tackle on fourth-and-goal by senior safety Carlos Hutton kept the Lions out of the endzone. This was the last action of the game, as West Georgia ran out the final minutes on the ensuing drive. 383 of the 490 offensive yards were gained on the ground for the Wolves. Senior Dallas Dickey finished the game 12-22 for 107 yards and one interception. 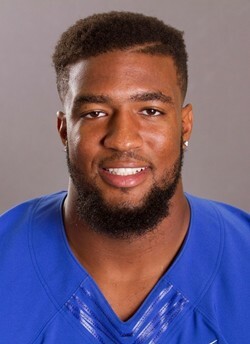 His passing performance was below his season averages, but he had 123 yards on the ground, and continued numerous drives on 3rd down with his scrambling abilities. I asked Dickey to comment on his ability to scramble so easily Saturday. Dallas also ran the offense very fluently and produced numerous scoring drives. Freshman Devontae Jackson was the leading rusher on the day, with 16 carries and 142 yards. This was his first 100-yard game of the year. Redshirt freshman Will Garrett had 42 yards and two rushing scores on the day for his second week in a row. Lamarcus Franks took a backseat to Jackson this week in the running game, but was still successful with 53 yards on 7 carries. The offense dominated the game as a whole, as they won the time of possession 36:57 to 23:03. Shaq Hall led the team in receiving with 42 yards on 4 receptions. Qa Walker was held without a reception, which is a rarity for him. Marcus Sayles had 8 solo tackles on the day and one blocked field goal. He also looked to get a hand on a punt early in the first half, but ended up just disrupting the direction of the kick. Marcus Sayles continues to be a force on special teams for the Wolves, and this week was a force on defense. Dylan Donahue had two sacks in the game, regaining the lead from Alex Armah for team-leading. Donahue also sat a game vs Fayetteville State earlier in the year. I asked Dylan to comment on his relationship with Alex and how it feels to be battling with him throughout the year. The UWG defense was excellent on third down, as they have been all year. Saturday, they only allowed 4 attempts to be successful out of 14 total tries. This win marks the third in a row vs a ranked opponent, and gives UWG a 4-0 conference record. It also moved them into the 1st place spot on the D2football.com poll, the Hero Sports poll, the first Super Region 2 poll, and the American Football Coaches Association poll. This is the first time UWG has ever been ranked number one in division 2. It is also the first time since 1999 that UWG defeated Valdosta State, Delta State, and North Alabama in the same season. 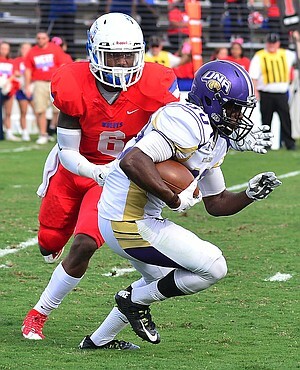 UWG’s next game is in Clinton, Mississippi vs Mississippi College who is 2-5 on the year. They will then travel to Melbourne, Florida to take on Florida Tech (5-3). West Georgia and Florida Tech have 3 common opponents this year. Florida Tech beat Delta State 41-37 and West Alabama 24-13. However, they lost to North Alabama 55-48. West Georgia, of course, has beaten all those teams by no less than 18 points. 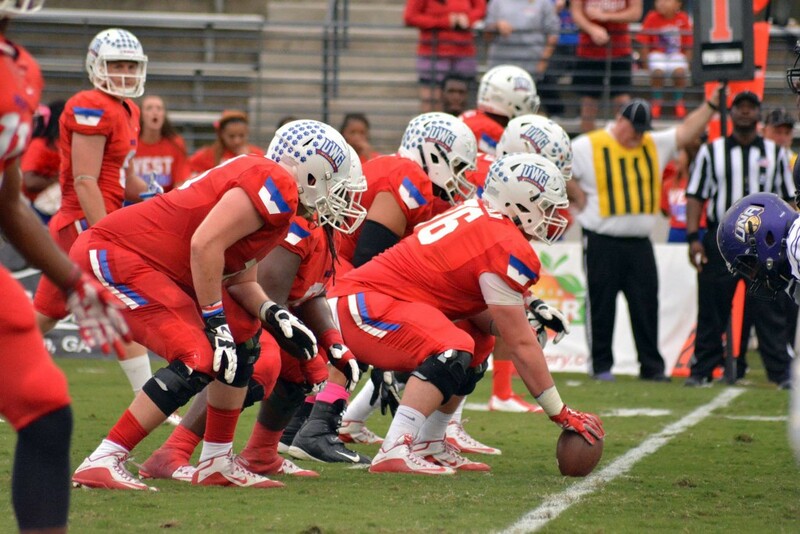 The last game of the regular season will be a home game for UWG, against Shorter. Nothing has changed from last week to this week, regarding my predictions on the year. I still see the Wolves going undefeated in the regular season. Now, it is likely they will go into the playoffs with the number one sport nationally. Thanks again to the men and Women of GSC and ESPN 3 who made the opportuniry to be in the box possible. Thank you to Matt Cooke of the athletic department, Samuel Crenshaw of PeachStateCollegeSports.com, and the play-by-play commentator Don Russell and color commentator Rick Rhodes. I hope to work with you all again some time in the future.